The Mastercraft Strategy tire is Mastercraft Tires answer to a solid performing everyday all-season driving tire. No, it may not be the best handling and cornering tire you can find, but it does provide a quiet and comfortable ride to go with predictable handling. The tire itself is M+S rated and has four circumferential grooves in the tread to evacuate water from under the tire on wet road surfaces. Added sipes contribute to the all weather traction capabilities as well. Ride comfort and low road noise are accomplished through Mastercraft’s computer enhanced sound system that optimizes the pitch sequence. You’ll also find a 60,000 mile tread warranty for years of driving use. The notched center rib tread design helps give the tire a much better and more even tread wear. Prices on the Strategy tire range from around $60 for the 13″ model, to approximately $120 for the larger 17″ series. Who Are Mastercraft Tires Strategy Tires Designed For? Mastercraft has designed the Strategy tire for drivers of various older model coupes and small sedans who are looking for an all-season tire that works well in everyday driving use. Some of the models the tire can be used on include the Honda Fit, Toyota Echo, Hyundai Elantra and many others. 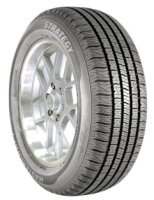 Mastercraft Tires backs the Strategy tire with a 60,000 mile tread wear guarantee. Materials and workmanship is also covered for 60,000 miles and includes free replacement during the first 25% of tread wear, followed by a prorated amount for the remaining period. Do I Need To Break In My New Tires? Copyright © 2019 Tire Reviewer. All rights reserved.